The highly anticipated bundle of joy is finally here. Our puppies were born on December 13th, weighing between 4.50 to 5.00 ounces with an estimated adult weight charting at 5 - 5.5 Lbs. We have 2 males & 3 females. One of our male puppies is already spoken for. We are accepting deposits to reserve a precious little bundle of joy for you. For more inquiries and to arrange a visit with your puppy, please contact us at 1-877-301-PAWS (). · Veterinary & past litter references. · 6 weeks of complimentary pet insurance. · Family raised, nurtured, happy & healthy puppies. · De-wormed twice and 2 sets of boosters administered. · Dew claws removed, tail docked, micro-chipped and CKC registered. · Transfer of CKC ownership after proof of spay / neuter at about 6 months of age. · 12 months written health guarantee against congenital/genetic disease, from the day the little fur-ball leaves our home. · Research your breeder, do they have website? · Do they provide veterinary & other references? · A puppy does not stay a puppy forever. Research your breed. · Visit their home and observe their interaction with their puppies and dogs. · Do they show love and affection, do they treat them like a family member? · Do they provide a 12 month written health guarantee or just 30 days? · Are the puppies de-wormed, dew claws removed, tails docked, micro-chipped? · Are they a current member of the Canadian Kennel Club (CKC)? · No reputable breeder will guarantee a weight. The charts are only an estimation of what the adult weight should be. · Beware of marketing words such as ? TEACUP?. 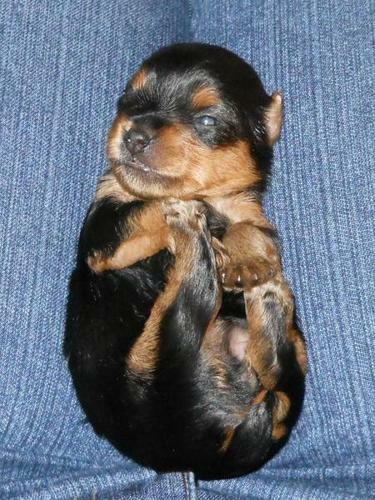 The so called teacup is the smallest frail puppy from the litter. They are prone to illnesses. · The CKC does not recognize the ?Teacup? as a breed of Yorkie. The Yorkshire Terrier belongs to the Toy Group, because of their small size in general. To reference the CKC, please see their website. Most importantly, please say NO to ?Puppy Mills? and do not buy from the stores. Pets are a commitment and can provide us with a lifetime of love and companionship.